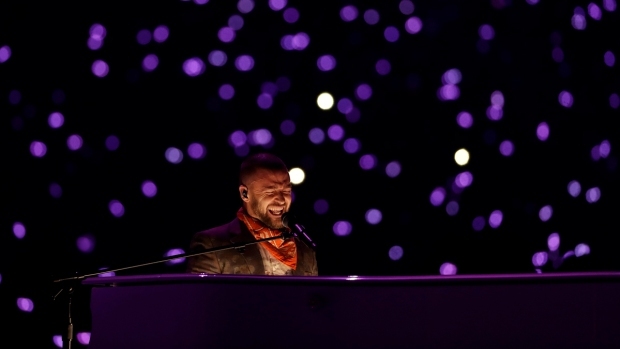 Despite promises by headliner Justin Timberlake that there would be no holograms duets with Prince, the purple one did appear via projection during a rendition of "I Would Die for You." Justin Timberlake ended his Super Bowl halftime show on Sunday with no unintentionally exposed body parts. Still, the singer made reference to the infamous 2004 Super Bowl "wardrobe malfunction," the incident where he raised a ruckus by yanking off part of Janet Jackson's costume and freeing her bare breast. Timberlake played "Rock Your Body," the same song he performed with Jackson 14 years ago that resulted in "nipplegate." This time, though, Timberlake omitted the lyric that proclaims "bet I'll have you naked by the end of this song." It may have been the only thing left out of the halftime show, where Timberlake seemed intent upon involving everyone in the stadium except the Eagles and Patriots. He appeared to try every idea thrown at him in production meetings. One may have worked well — opening his set in the bowels of the stadium in what was made to seem like a small club — if the performance hadn't rendered his new single "Filthy" unintelligible. Timberlake climbed steps out into the stadium, down a runway to a stage while singing "Rock Your Body." He was constantly surrounded by dancers, enthusiastic musicians and jumping audience members, so much so that it made the star of the show seem small. He danced on the NFL's midfield logo, brought out a marching band dressed in tuxedos, gave audience members giant reflecting mirrors, played at a gleaming white piano, had two elaborate stage sets and even climbed into the audience to take "selfies" with a young fan. Sitting at the piano, he performed a "duet" with the Twin Cities' late star, Prince, whose image was projected on a giant scrim beside Timberlake. It was a touching tribute, particularly when cameras outside the stadium caught Prince's insignia in lights, although the song choice of "I Would Die For U" felt unnecessarily macabre. Timberlake was at his best in his breezy hits "Sexyback" and "Can't Stop the Feeling," which emphasized his appeal as an adept song-and-dance man. It was why the NFL brought him back despite the history with Jackson. In fact, a backlash had grown recently among people who wondered why Jackson seems to be forever punished for the "wardrobe malfunction" while Timberlake skated by. Perhaps that left him feeling that he had to try too hard to get back into the public's graces. #ToldYa But no worries, we will all be together this spring for the star ceremony. Awesome halftime Justin! Who said it was a hologram?! He wasn't the only performer at the Super Bowl. Leslie Odom Jr. performed "America the Beautiful" before the game and Pink sang "The Star Spangled Banner," perhaps the most anticipated version of the national anthem in Super Bowl history. After a season where a political controversy was caused by some NFL players who protested against police brutality by kneeling during the national anthem, cameras watched to see if the Super Bowl would be used as a protest venue. But none of the players took part in any demonstration. Pink took a throat lozenge out from her mouth before singing. She seemed to sing to a pre-recorded track, since the performance had an orchestra accompaniment and there wasn't one on the field.